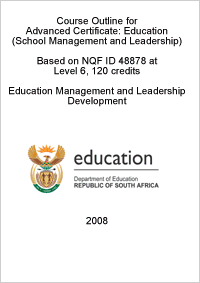 The South African National Advanced Certificate in School Leadership and Management is the product of an initiative spearheaded by the South African Department of Education in response to a concern: despite many educators being involved in or graduates of various school management and leadership programmes, there was little evidence of improved practice. The national initiative sought to bring together a representative range of stakeholders from government to unions and from public institutions to NGOs to design and develop a programme that would bring about positive change. Read the overview of the curriculum, as well as the development and evaluation process here.